Rowdy crowdsurfed last year when the Raiders knocked off the Bulldogs 69-64. It’s hard not to be excited about the Jan. 6 Wright State basketball game against archrival Butler. Before the contest, spectators are invited to the annual Beat Butler Bash for music, raffles and free food. “Our basketball team plays better when students pack the Nutter Center and cheer us on,” said Billy Donlon, coach of the men’s basketball team. To encourage student attendance, the Student Alumni Association, Student Government and Athletics are working together to host the Bash. 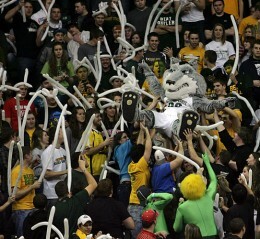 The Wright State pep band, Rowdy and the spirit unit will be on hand to get the crowd pumped up for the game. At halftime, The Amazing Christopher will put on a musical puppet act. The first 5,000 fans to arrive will get free white T-shirts, courtesy of Miami Valley Hospital. Everyone is encouraged to wear white for this “whiteout” game. Students with valid Wright1 Cards will receive two free tickets to the game when entering through Gate Nine of the Nutter Center. The box office opens at 4:30 p.m., just in time for the festivities. Students are encouraged to take the free shuttles to the Nutter Center from the Student Union or the residence halls.